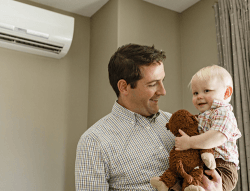 Ductless heating and cooling systems are becoming more common throughout the Dayton, Columbus and Cincinnati areas, but do you really know all of the benefits that they can bring to your home? Unlike a traditional system that forces conditioned air through ductwork, ductless systems are designed to heat and cool certain zones. They don’t require ducts, so they can be set up in almost any location. Ductless systems are one of the most energy efficient heating and cooling solutions around. They operate on less power than traditional systems, and by being installed by ‘zones’, you are only heating and cooling the areas you need to. Did you know that the quality of indoor air is often worse than outdoor air? Ductless systems offer a multi-stage filtration that can reduce dust, bacteria, allergens and other particles in the air. Because no ductwork is required, ductless systems are far less invasive to install than traditional systems. Mitsubishi mini-split systems run on small pipes that require just a small hole, so homeowners don’t need to worry about fixing walls or ceilings where ductwork would have been installed. Ready for a free in-home evaluation? Let our experts find the best solution for you.